When I was a young single girl living in the city, my girlfriends and I used to go to dinner at a Greek restaurant called Taverna Plaka. Whether or not it was authentic, I have no idea.... but I'm leaning towards not. It was a really fun place though - good drinks and food, a fun atmosphere, and belly dancers. We'd have dinner, then hit up some of our favorite bars to find cute boys. My favorite thing to order (along with a few fruity martinis) was Halloumi cheese flambeed in ouzo. They brought it to the table and set it on fire, which always caused a spectacle. Then once the fire goes out, you're left with gooey, rich, and ridiculously decadent cheese. So let's call that the "bad boy" cheese - a little dangerous, soaked in liquor, and not at all good for you. Pretty much what I chased back in those days. And if that's the case, then this grilled halloumi would totally be husband material. It's grilled, not soaked in liquor - much safer, right? And it's topped with a sweet relish of grilled grapes, toasted walnuts, and fragrant rosemary. Much better for you in the long run. This is my "Joey" cheese. And I love it. The grape relish plays just wonderfully off of the grilled halloumi and the slightly garlicky bread. If you're not familiar with halloumi, it is a mild and slightly salty cheese that doesn't melt like most cheeses. When grilled, it gets softer and creamy, but still holds it's shape. This was a nice romantic dinner that we enjoyed together after the kids were in bed. On the patio, with a refreshing rose'. It's a far cry from my single girl days, and I'm totally okay with that. Prepare a high gas or charcoal grill fire. Drizzle the onion slices with 2 tsp. of the oil and lightly season them with salt and pepper. In a small bowl, mix 2 Tbs. of oil, the garlic, and a pinch each of salt and pepper; brush the mixture evenly over one side of the bread slices. Drizzle the grapes with olive oil. Meanwhile, toast the walnuts in a small skillet over medium heat, stirring frequently, until golden-brown, 4 to 5 minutes. Transfer the walnuts to the bowl of a food processor and add the rosemary. Pulse a few times, until the walnuts are coarsely chopped. Slice the halloumi into 1/2-inch thick slabs and rub both sides of each piece with olive oil. Put the onion slices and bunch of grapes on the grill grate. Cover and grill, turning once, until the grapes are bursting and the onions are grill marked, about 10 minutes. Coarsely chop the onion and add it to the food processor. Using tongs or your hands, pull the grapes off of the stems and transfer to the food processor. Add a pinch of salt and the balsamic vinegar, and pulse a few times. Clean and oil the grill grate. Put the bread and cheese on the grate and grill uncovered, turning once, until marked on both sides, 4 to 5 minutes. 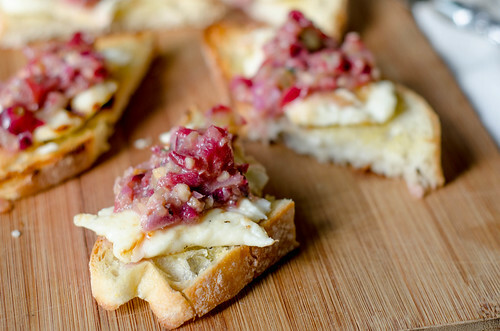 Divide the cheese, bread, and relish among 4 plates and serve immediately. I thought that was such a cute story, because it ended with "This is my Joey cheese." So sweet! I've never had halloumi before, but your photo is so gorgeous, it looks like I am going to have to try it now! Oh my dear God, yum. Aw, thanks, Tara!! You will love this - it's so good! We made this last summer and absolutely LOVED it. And I agree - great post! Brianna! I knew I saw it on someone's blog last summer, but I couldn't remember who's! I can't wait to make it again - it really is so awesome! I love halloumi cheese. I'm going to have to try this. Nico and I love to have a cheese plate for dinner some nights. This would be a great change of pace. Great post. Very poetic. I LOVE the metaphor. There's a time in your life when bad boys are fun...but then there comes a time when you just want to find someone who will make you happy indefinitely and not drive you insane for all of time. Grilled halloumi definitely sounds like the former. love this. This was a great post! I had never heard of halloumi until this year in Australia when I ordered this amazing breakfast stack with potatoes, spinach, a poached egg, bacon, and halloumi (which I didn't even know was cheese)! I will have to make this - it sounds very Australian to me so I can be nostalgic! What a cute post, Josie! The cheese metaphor had me laughing and the recipe has me drooling. Michael and I would definitely love this. I really like the the sound of the grilled halloumi and grape combo! 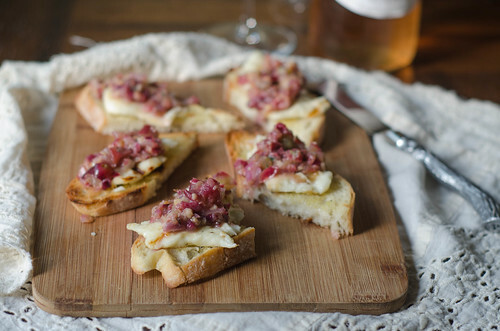 Topped toasts are one of my favorite & this grape relish looks divine! Great mix of flavours! Actually had all ingredients on hand minus the rosemary, but even without, tasted just wonderful, salty, sweet, crunchy.